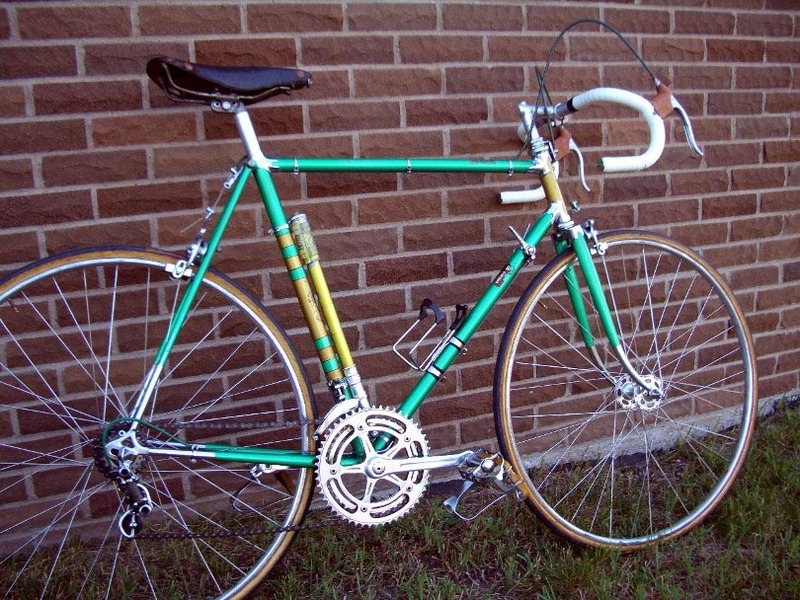 Frame Size: *Seat Tube: 58 cm center-top or 56 cm center-center. 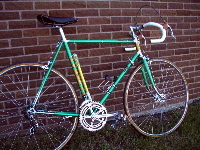 *Top Tube: 57 cm center-center. *Seat Lug Serial #1332. I bought this bike in Italy. It seems to have been very well kept. Cosmetics: Nice original deep green paint with a few scratches--worst is on chainstay, see foto. 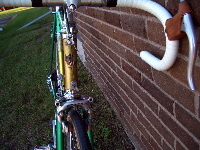 Also note the corrosion under the brake cable on top tube--see foto. 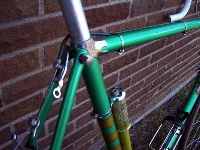 There are a few small paint chips and scrapes, but I couldn¹t find any dings or dents on the frame. 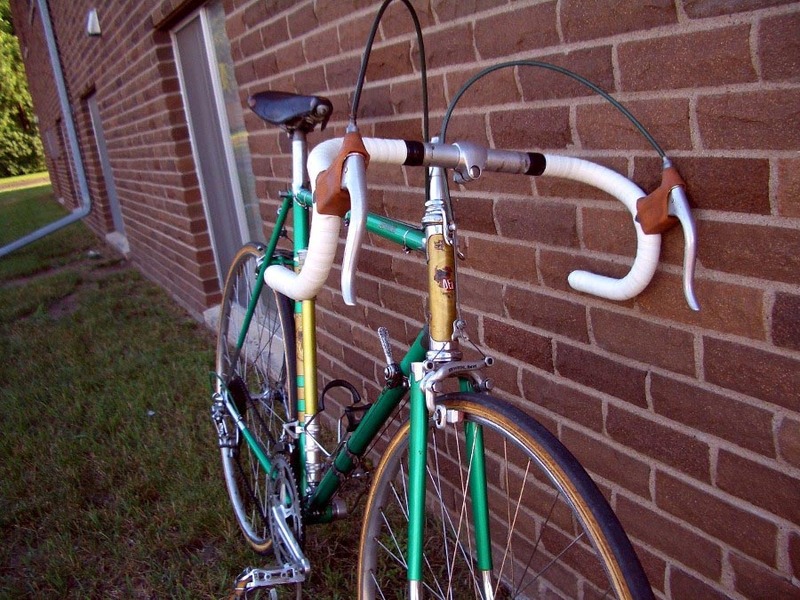 Umberto Dei Decals are breaking up, especially on head tube--see foto. Chrome is BELISSIMO! Components are excellelent. ORIGINAL Equipment: Universal 61 Brakes, Full Campagnolo Record, except pedals and Universal 61 brakes. Equipment is very nice and shows less than normal wear for its age. Was Pedals and Fiamme Stem, Bottle Cage, Toe Clips/Straps are probably NOT original. Crankset: Campagnolo Record No Date Strada170 mm. 52-44 rings with 151 mm bolt circle diameter. 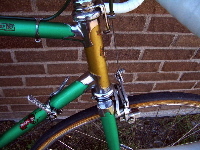 Cranks show some toe strap rubs. Wheels: Campy NO Record hubs, and Nisi tubular serrated rims. Wheels are excellent and appear original. Rear "Nisi" decal is almost completely intact. But, Front "Nisi" decal is almost completely missing. Front Locknut is "65" date stamped. Brakes: Universal 61 Center-pulls in excellent condition with new gum hoods. Chrome on QR and hangers is perfect. Pump: Original Silca "DEI Pompa," was originally painted to match the frame, but has badly faded. Original unfaded Dei Green can be seen under metal cover. Pump head is a copy of Campy. Saddle Italian Leather Made in Bologna. Leather is badly cracked. I cannot read the name on the logo. 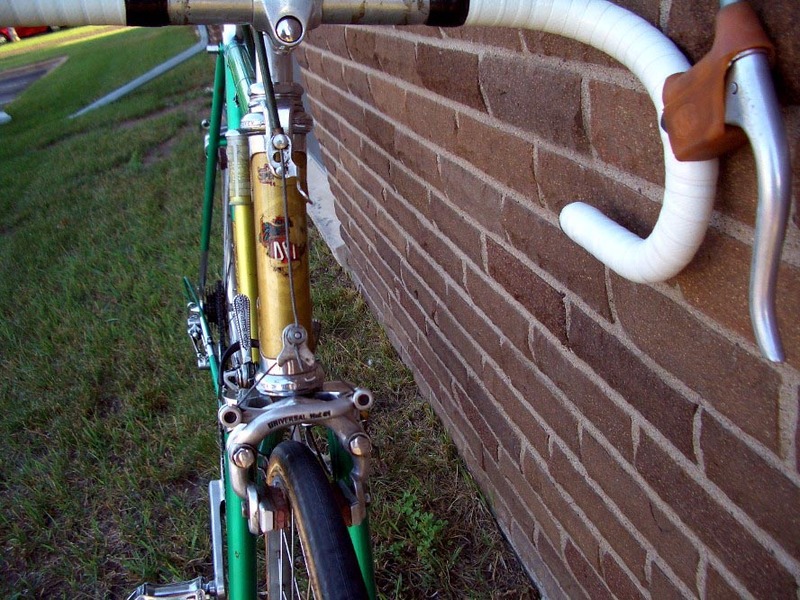 Seat Post: Campy 26.8 mm. PINCH BOLT: Extra Long! Tires: Tubular Sew-up Michelin model "Joyful," have seen happier days. They should be replaced. Please glue tires to rims. Pedals: "WAS" Pedals are Campy Copies. Good Condition. One dust cap is a replacement and not original. Toeclips and straps are later models. Pedals are probably period correct, but I'm not sure why they are not Campy. 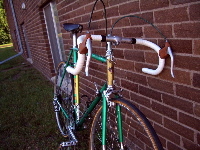 Bar/Stem: Fiamme alloy stem with 6mm allen/3ttt Gran Prix bars. Stem appears newer than bike. I'm not sure about bars.